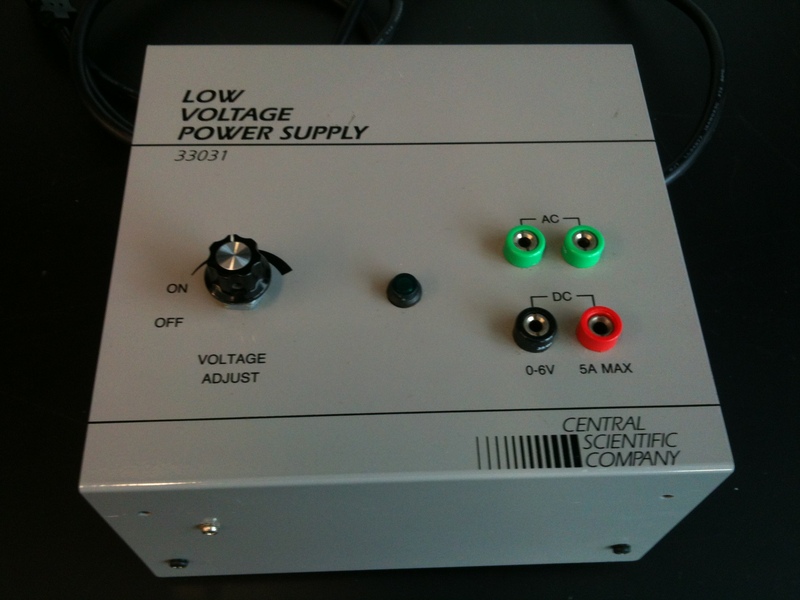 We use the Cenco 33031 Low Voltage Power Supply (Figure 1) for several of our electricity and magnetism labs. It can provide variable DC up to 6 Volts at up to 5 Amps, and it can provide a steady AC voltage at around 22 VAC. Unfortunately, our students sometimes exceed the 5 Amp DC limit and damage the supply, rendering it useless. The problem is almost always the main power transistor. We have even tried adding a 5A fuse in the DC output circuit, but the power transistor blows out much more quickly than a fuse. We recently switched some devices to use 4A fuses, with some success, but in the case of a short circuit this small difference will probably not matter; the power transistor will blow first. 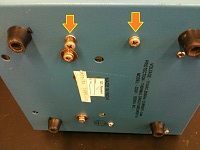 Presented below are step-by-step instructions for replacing the power transistor. Another component that might need to be replaced is an LM317 voltage regulator. We will add instructions for replacing that sometime in the future. Meanwhile, when the DC fails, the first thing to try is replacing the power transistor. You may be able to re-use the mica heat shield, but you won’t know that for sure until you remove the power transistor, so you’ll want to have one on-hand just in case. While it is also optional, it can be helpful to use a plastic compartment box to hold the screws and other parts during disassembly. If you don’t have a plastic box, an egg carton works just as well. See the addendum below for an estimate of the time required for the repair. 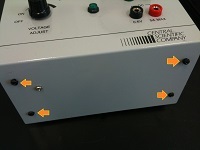 Remove the 8 small case screws (see Figure3), gently lift the cover, and slide it to the right. Remove the 2 screws holding the heat sink to the bottom of the case (shown in Figure 4). Be careful not to bend or break the leads on the voltage regulator, which is the black chip with 3 leads which is attached to the heat sink. Those leads can break off easily. Figure 4: Heat sink screws. You will find two components connected to the heat sink. The power transistor sits on one side of the heat sink and is connected to it by screws at both ends. On the other side of the heat sink is an LM317T voltage regulator, a smaller black chip with 3 leads. There are tie wraps around bundles of wires for neatness. 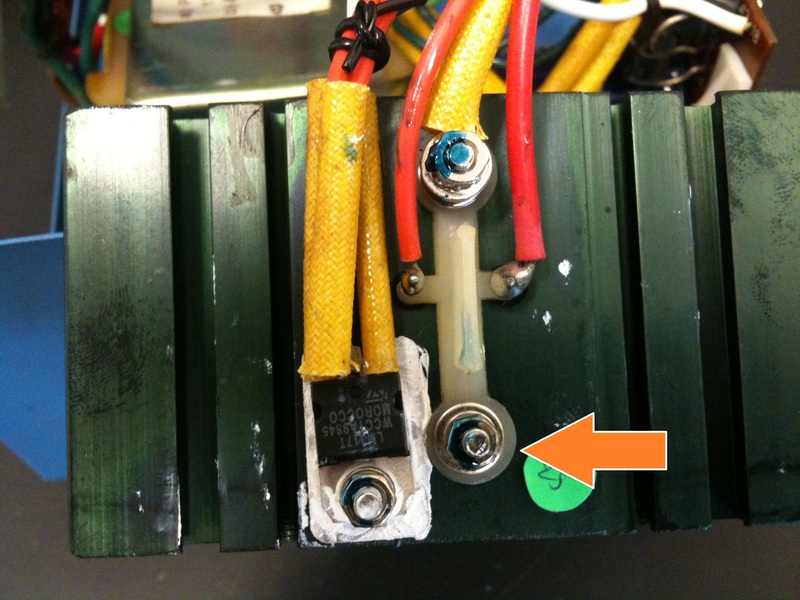 Remove these as needed (and replace on reassembly if you can).Start with the screw at the far “plain” end of the transistor – the one without a wire attached (see Figure 5). Remove and save the nut, washer, lock washer, and the screw. Figure 5: First transistor screw. Then go to the other end of the transistor, and remove the top nut, washer, lock washer, and the wire lug. You can’t see the color of the wire in the picture because of the yellow insulating sleeve, but you’ll easily see that this is the white wire. There is another nut and washer underneath the first. Heat the solder and remove the red and orange wires from the power transistor, shown in Figure 6. 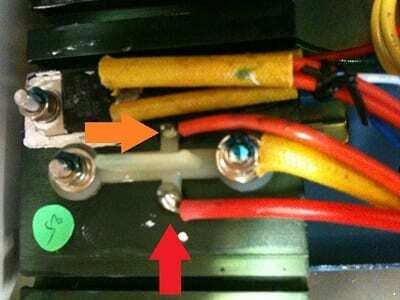 Take care to avoid excess heat or you will damage the plastic insulator between the two wires. Figure 6. Red and Orange wires connecting to Power Transistor. Note the placement of the wires. The thicker red wire is farthest from the voltage regulator (black chip) and the slightly thinner orange wire is closer to the voltage regulator. Now remove the remaining nut, washer and screw from the power transistor and save these. Once the wires have been removed, you can clip the leads on the power transistor as close to the heat sink as possible to facilitate removal. Pull up on the plastic insulator by the center tab (the part which was between the red and orange wires). Push the cut leads from the back to release the transistor. You can leave the mica insulator in place if it is still contacting the heats sink. If it comes off the heat sink then you’ll need to gently clean the surface and either reuse it (if intact) or replace it. Be careful, the mica breaks easily. In any case, spread a fresh layer of heat compound over the mica insulator to make a good thermal connection to the new power transistor. Place the new power transistor where the old one was, with the leads through the holes in the heat sink and through the holes in the plastic insulator. It may not be obvious at first, but there is a slight asymmetry — the leads are offset from the centerline — so that you can only put the transistor in one way, and only orient the plastic insulator one way. Reinstall the screws at both ends of the power transistors. Keep in mind that the longer screw goes on the end that will connect to the wire lug on the white wire. It’s easiest to connect the wire lug last, when the other screws are holding the power transistor in place. Re-solder the orange and red wires to the power transistor. As shown in Figure 6, the orange wire is closest to the voltage regulator (black chip) and the red wire is farthest from it. Test the repair before you screw the heat sink back in place or the cover. The power supply should now go up to at least 6VDC when turned all the way up. If not, you’ll have to check your work more carefully. You may have to replace the voltage regulator too. Reattach the heat sink to the case. Close the case with the 8 case screws. The last thing we will mention is that some students have taken to turning the power supply on it’s side, so that the “top” faces forward instead of upward. The case screws can then scratch the table, so I’ve been adding rubber feet next to the case screws to prevent such scratches. 12 March 2019: The last time I made this repair it took me 35 minutes from cracking the case open to closing it up (all 8 screws), and I had done it before, but not recently. If I was to do another immediately I could probably get the time under half an hour, but if you’ve never done this before then plan to spend at least twice as long.